Whilst researching the history of my W.B. Haigh chisel morticer I came across a copy of their 1872 catalogue on the University of Reading website - link here. This was also the year of President Grant's re-election, the great fire of Boston, Louis Bleriot's birth, Samuel Morse's death and the first FA Cup, won by Wanderers beating the Royal Engineers 1-0 at Kennington Oval before a crowd of 2000 spectators. By nibbling the end off the URL I found my way into a fascinating and rather large repository of such catalogues here! There are many things to tickle the interest of the casual observer in these publications, the language is fascinating - 'stuff' being commonly used for timber, 'Rabbiting' still apparently in common usage in England, before it gave way to 'rebates' and 'housings', only to be perpetuated in the US and reintroduced to the UK by Norm Abram - much to the disgruntlement of those of us who are used to rebates and housings! The other thing to strike me was how similar these machines are in design to many of their modern day counterparts - and much more solidly made. Even though they only had belt drive or hand power, the design of many recognisable machines was devised by these guys and in most cases remains virtually unchanged. In many ways I'm sorry to part with the morticer, it really is a beautifully made thing and I would have loved to restore it to concourse condition. An icon of that fleeting moment between hand chisel morticing and the arrival of the hollow chisel morticer. Nonetheless, the decision has been made and I'll just have to get used to the concept of being a bloke who used to own a W.B. 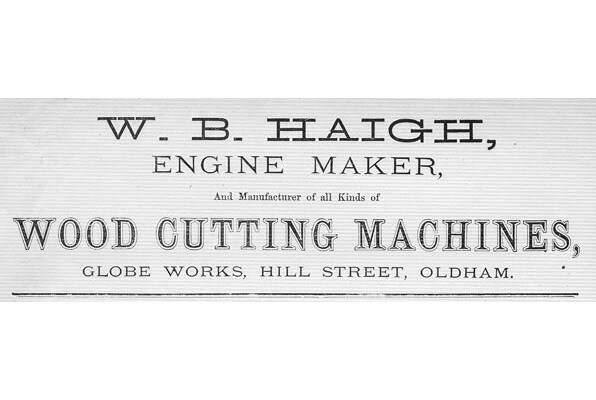 Haigh chisel morticer - made in Oldham - by men in hats. 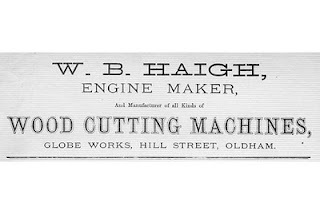 I now know how Mr Clarkson of Brierfield felt about his wall mounted spindle moulder when he wrote on October 26th 1877: "I beg to say that I like your "wall spindle" very well.....In fact, I should not like to be without it on any consideration". It's great that you can find out so much information about your machine and the manufacturer. I've never been able to find anything on my "Smiths Woodworker" mortiser, even though it looks very similar to a Multico machine.